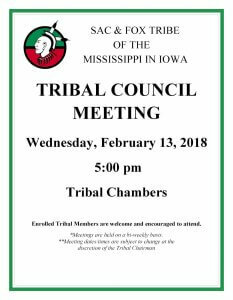 The next Tribal Council Meeting has been scheduled for Wednesday, February 13th starting at 5:00 pm in the Tribal Chambers. Enrolled Tribal Members are welcome and encouraged to attend. *Meetings are held on a bi-weekly basis. **Meeting dates/times are subject to change at the discretion of the Tribal Chairman.